Recently I ran across an article explaining why the tick problem is so rampant, especially in the eastern part of the state. Do you know who is to blame? Humans! It is due to the decrease in the population of the timber rattlesnake caused by human encroachment. Yes, I am serious. Think about it, what do rattlesnakes eat? Mice, chipmunks and other small rodents are all hosts for ticks. With a decreased number of snakes, the rodent population has increased allowing for the increase in the number of ticks. When the snake devours the rodent, any ticks are also part of the meal. Next time when you are out hiking and you run across a rattler, give it a salute and thank it for a job well done and then go the other way. Apparently the news has reached the general population about the horrible invasion of the spotted lantern fly. I received an almost frantic call from a homeowner in Avis. She said that there were hundreds of bugs around her foundation and other areas and they quickly disappear when approached. Never had this problem before and was afraid she had this new pest at her home. I asked her to send me pictures, which she did. Good news is that she was not being invaded by the spotted lantern fly. She has a nasty infestation of box elder bugs looking for a place to stay over winter. Basically, I went into the history of the box elder and what she could expect this winter. For those of you who have evergreens on your property, please do a bagworm check. Another call this month was concerning the death of an arborvitae. After a conversation with the homeowner and with her description she confirmed the presence of what appeared to be “pine cones”. I drove past her house and yes the arborvitae will need to go. The sad part is that her driveway is lined with beautiful arborvitae plants and they may or may not be infected. As gardeners we are always looking for that ideal plant that has everything. I found just such a tree, but with all its good qualities such as being drought tolerant, bees of all types love it, butterflies flock to it, showy flowers, and edible, when ripe, berries, it does have one major drawback. When your common name is the devils walking stick, Hercules’ club, prickly ash, or prickly elder, you know there is a problem. The Aralia spinose’s common name is well founded. Growing from the trunk and branches are very sharp thorns. The Native Americans would plant these around gardens and villages to deter animals or other unfriendly elements. There is nothing like a row of thorns to keep undesirables away. Without the thorns, this would be an excellent native plant to use in the gardens. We all have a fear of being stung when a bee or wasp comes within 10 feet. The funny gyrations that we go through when we spot one, are worthy of a spot on “America’s Funniest Videos.” Being stung is very serious, but if you do not agitate the winged insect, they will not bother you. Bees, we feel are important and we take pleasure in having them visit our plants. We realize they are pollinating the plants they visit. But wasps do not insight that pleasure, why? They certainly are not “cute and cuddling” looking, not that I would cuddle a bee. Their appearance alone with their bright coloring tells us to stay away. But the wasps, hornets and yellow jackets have a very import niche in the scheme of things. They do help pollinate, but their main purpose is pest control. They capture caterpillars and sawflies to feed their young. Left alone and if we pose no threat, they could care less about our presence. It is this time of year that they will pose a danger. With their natural food source disappearing, our protein laden burgers or hotdogs or the sweet sugar of our drinks become a food source. During the normal summer season, trees and shrubs may shed some leaves. This is just the plants way of coping with the weather or that the number of leaves are no longer needed. This year I noticed some unusual leaf drop. Actually the leaves turned brown. I thought it must be the weather. It turns out I was correct. An article from the western part of the state wrote about the leaves that have fallen early. This was not your usual fall time leaf shedding. According to the article, the cool, wet weather has contributed to the appearance of fungus related problems. Hopefully my one shrub and tree that dropped many leaves this year will have no lingering damage and will be fine come spring. If you feel this may be happening in your yard, contact the Penn State Extension for help. If it weren’t cool this time of year and with Halloween just around the corner, the following would fit with weird and scary theme popular this time of year. The hag moth and the larvae, slug monkey, are what one would say….“What the Hades (actually there is a shorter word I could use) is that!” The larvae of the Phobetron pithecium or hag moth will use as a host apple, ash, birch, cherry, chestnut, dogwood, hickory, oak, persimmon, walnut and willow. The caterpillar is one of the strangest creatures that I’ve seen. 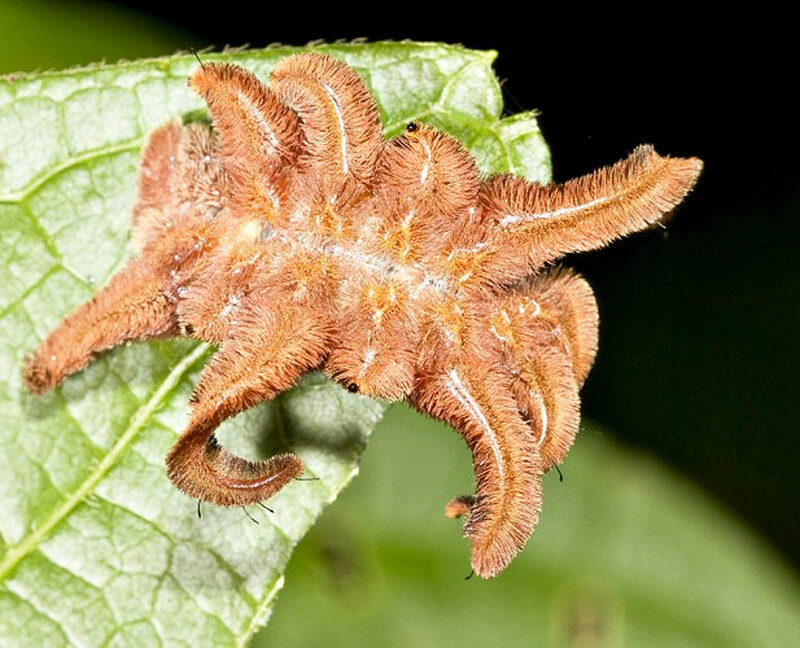 A flat hairy caterpillar with three long and three short leg looking projections that almost remind you of a fallen leaf or the skin that had been shed by a hairy spider. I want to include a website that I think is very informative regarding the spotted lantern fly. This will give you a lot of information and what to do if you come across this pest. Getting rid of the pest is like trying to find a needle in a haystack. It just isn’t going to happen, but we can try to keep it somewhat under control. https://news.psu.edu/story/535605/2018/09/10/impact/spotted-lanternfly-expert-provides-tips-home-management-pest Please feel free to ask me questions. Your questions give me material about which to write. Email me at qstocum@gmail.com or if you see me out and about, stop and talk to me. I thank everyone who has contacted me. Remember, it is easy to be green. Happy gardening!